Alia Bhatt and Ranbir Kapoor are enjoying the scenic views of Bulgaria. The Brahmastra stars are rumoured to be dating each other. Alia Bhatt clicked by Ranbir Kapoor in Bulgaria. Alia Bhatt and Ranbir Kapoor are back on the sets of Brahmastra. 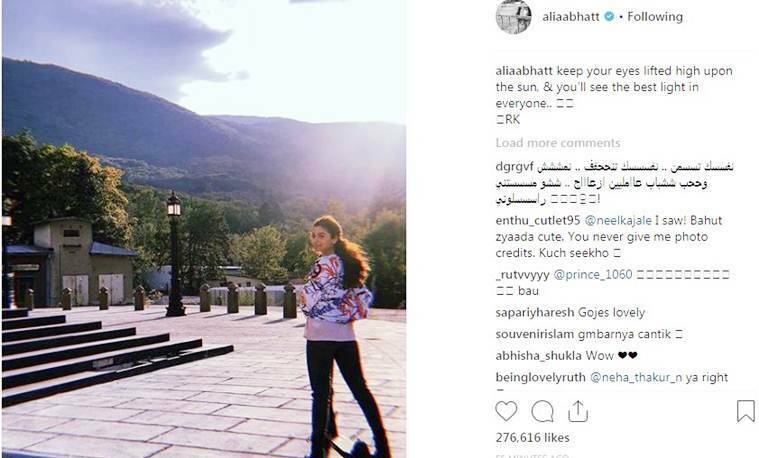 It seems Alia has become Ranbir – The photographer’s muse as once again he has clicked a photo of the actor during an outing in Bulgaria. Alia took to Instagram and shared a photo of herself posing against the light with a beautiful scenery as a backdrop. She gave the photo credit to rumoured boyfriend Ranbir. Recently, Ranbir’s father Rishi Kapoor spoke about the alleged relationship. He said that Ranbir “likes” Alia and like his uncles or himself, Ranbir also has the right to choose his life partner. “It’s Ranbir’s life. Who he wants to get married to is his prerogative. Neetu likes her, I like her, Ranbir likes her. Get it? I can’t be judgmental. After all, my uncles Shammiji and Shashiji and I chose our life partners. Ranbir is entitled to choose his,” the actor told Mumbai Mirror. In fact, Ranbir too has been vocal about his feelings for the 25-year-old actor. Post Brahmastra, Ranbir Kapoor will be seen in YRF’s Shamshera, while Alia Bhatt will appear in Gully Boy.